1964 was the year Anchor Bar first started serving Buffalo chicken wings. There are several family stories about how the snack came to be, but what’s certain is that Teressa and Frank Bellisimo’s creation was a hit. The classic mixture of butter, vinegar and cayenne pepper sauce is tossed with fried wings to create this finger licking food that is now enjoyed all across America. Rather than going the traditional route of frying chicken wings, I chose to make my pizza recipe a little bit healthier by grilling chicken breast. Then, I pulled the chicken with a fork and mixed it with a little bit of Anchor Bar Wing Sauce . After I pre-baked the dough I spread on about 1/4th cup of wing sauce, drizzled on chunky blue cheese dressing, sprinkled on mozzarella cheese and then topped it with the pulled chicken. After a short time in the oven the aroma of the pizza quickly filled the kitchen and our mouths started watering. The wing sauce along with the blue and mozzarella cheeses tasted delicious and had just the right amount of spice. 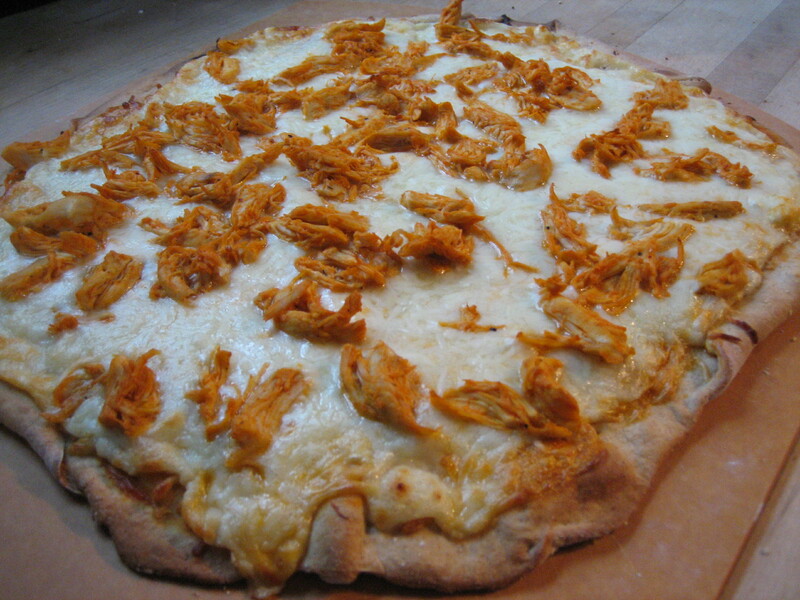 My Buffalo Chicken Wing pizza recipe is one of my favorites and will make watching Buffalo Bills football games much more palatable. This entry was posted in Autumn Recipe, blue cheese, Buffalo wing sauce, cheese, chicken, Meal->Pizza, meat, mozzarella, sauce, Seasonal and tagged blue cheese, Buffalo chicken wings, mozzarella cheese, pizza. Bookmark the permalink.